Sorry for no post yesterday. I got too caught up in playing video games, and it became 10 by the time I started working. Well anyways, here’s the chapter. p.s. Since it already became like this, do you mind if I don’t translate anything every Saturday? If you thought about it, the changes the elders went through were clearly big. As the Dark Moon guild’s size increased, enormous profits began to be made. Even though the guild couldn’t show themselves off in public to gain money, they still earned money by engaging in various jobs like becoming escorts. Thanks to the various methods they used to scrape in money, they were raking in quite a lot of cash. But while Neng Mu Gi, the Night Emperor, presided over the guild, no one dared to use the money for anything foolish. For his words were the law, and every one of his actions were a subject of awe. But Neng Mu Gi’s son, Neng Pa Chun, didn’t have any of the power that Neng Mu Gi had. When Neng Pa Chun became the president, the Dark Moon Guild, which seemed so formidable at first, began to crumble a little. The girl sighed at her father’s statement. Neng Pa Chun put on a hurt face when he heard her truthful words. 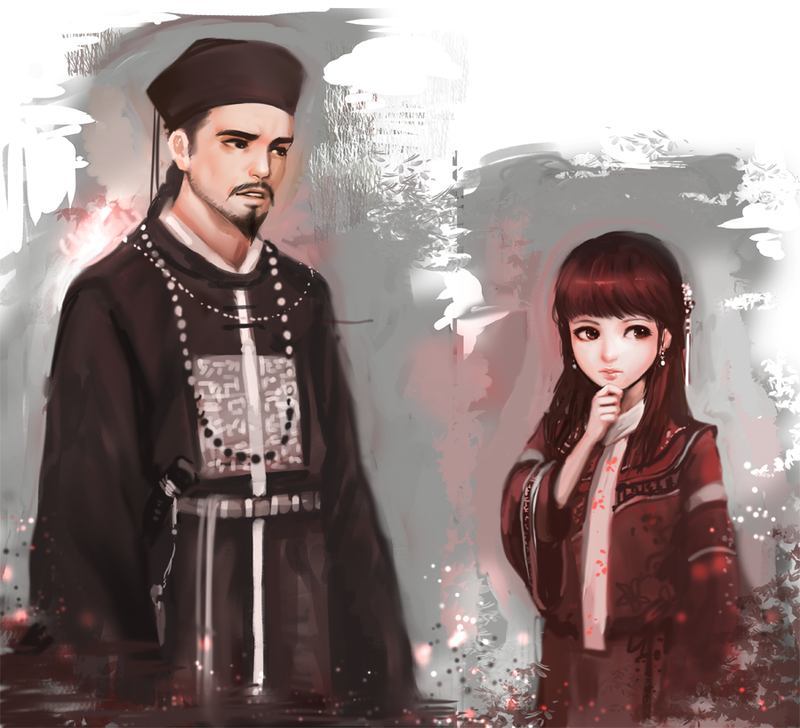 Neng Pa Chun’s father, and the girl’s grandfather. There was a difference of heaven and earth between Neng Mu Gi, one of the Sovereigns, and Neng Pa Chun. Personality or strength, Neng Mu Gi outstripped his son by far in both. They were different beings from the ground up. She was the granddaughter of Neng Mu Gi, Neng Ha Young (冷夏榮). The girl, who was known for her intelligence from a young age, so much so that she was even rumored to become an Unmatched Woman(才女) Under The Heavens, became confused. Even though her father wouldn’t be able to know, her grandfather most definitely predicted that this sort of a thing would happen. But seeing that he did not move an inch even though this happened, the girl figured that her grandfather had some sort of plan in his mind. Her father clearly was too lacking to become the manager of the greatest guild in the underground world, the Dark Moon Guild. In fact, he was really lacking. He became pretty strong in the martial world thanks to his blood, so some of the elements that he lacked could easily be ignored. But his personality or his ability as a leader definitely couldn’t be ignored like that, especially when he was the manager of the Dark Moon Guild. He had neither the right personality or the leadership to become a capable head. Because of that, Neng Ha Young was looking at the situation skeptically. She thought her father held a position he did not deserve. Neng Ha Young, after thinking a while, sighed. When it came to measuring up a person, there was none that could match up to Neng Mu Gi. But then, why did her grandfather put up his son as the manager? Neng Ha Young began to think carefully. Grandpa disappeared after announcing his retirement. At first, everyone accepted Neng Pa Chun even after Neng Mu Gi retired. This wasn’t because of Neng Pa Chun’s actual ability. This was because Neng Mu Gi’s giant shadow still lingered behind Neng Pa Chun. As the Dark Moon Guild was starting to grow, many of the stronger experts in the underground world, were invited to become the elders of the guild. Even they didn’t have any problems in letting Neng Pa Chun become the leader of the guild. While he was being recognized as such, Neng Pa Chun should’ve displayed his abilities to secure his power, but his talents were far too lacking for that. As time passed, and Neng Pa Chun’s insufficient abilities began to be shown to the public, the Elders began to fully let out their greed. The Dark Moon Guild was an extremely large organization. They were strong enough to be counted as one of the 3 Great Martial Groups. If they were this large, couldn’t they indulge themselves a bit? Even though they feared Neng Mu Gi, seeing that he hasn’t even taken action even till now, they figured that the man didn’t have any more attachments to this place. Even though they confirmed it, the elders were still being careful. Neng Mu Gi scared them that much. But it wasn’t like Neng Mu Gi actually didn’t have any attachments, either. He too, was annoying Neng Pa Chun by starting to be a little greedy. Neng Ha Young figured this was probably the final point. The elder’s patience probably hit the limit. If her father wasn’t even able to accomplish something like this, Neng Pa Chun wouldn’t be just scolded. Neng Ha Young feared that. Neng Pa Chun widened his eyes. No one knew where Neng Mu Gi was, since the man hid himself from public eye after retiring. That was why even Neng Pa Chun couldn’t meet his father, even though he wanted to see him greatly. Neng Ha Young stood up from where she was. Probably, no one under the heavens would be able to find her grandfather, who was determined to hide himself. All except her, that was. He couldn’t remember his father telling him anything about going anywhere. Neng Pa Chun tried thinking again more carefully. Still nothing. Neng Ha Young grinned from ear to ear. She had a very confident look in her face. Neng Mu Gi told his son this when he retired. When Neng Mu Gi said that, he gave Neng Ha Young a mysterious look. And Neng Ha Young was able to figure out the hidden meaning within Neng Mu Gi’s words. This was where Neng Mu Gi first met his master, the Qilian Sword Demon, and learnt martial arts. That was why Neng Ha Young was certain. After resting for the whole day, Cho Ryu Hyang was at the back yard with a wooden stick. He was contemplating upon something with a very serious look on his face. If he wanted to solve the problem given to him, he should change his way of approaching the problem. The answer he got after thinking a while, actually had quite a lot of restrictions. That’s why he was hesitating so much over testing it. Then, his father’s favorite phrase passed by in his mind. It was a very meaningful sentence. Cho Ryu Hyang set his mind in place after thinking about it. With a determined face, he started to draw a line on the ground. Right now, everything else disappeared in the world, and Cho Ryu Hyang could only see the line that he was currently drawing on the ground. What he was trying to do now was something extremely hard. But that’s what brought him enjoyment in the first place. Right now, Cho Ryu Hyang was carefully controlling his strength with utmost concentration, to draw a single line on the ground. Cho Ryu Hyang paid attention to even the thickness of the line as much as possible. The line he drew was as big as a small child’s height. But the real problem started here. Cho Ryu Hyang breathed in deeply, and went to draw another line, parallel to the line he drew just a moment before. He checked multiple times to see that the two lines were perfectly parallel. Starting with that, he drew a total of 8 lines. The work took about 1 hour till now. But Cho Ryu Hyang, without stopping, kept drawing more lines. When Cho Ryu Hyang finished drawing the last line, his whole body was drenched in sweat. He was that focused in his work.He fixed his glasses in place, wiped his forehead, and stared at his work. The work he created was a surprisingly perfect octagon. This was the formation that his teacher gave him. He drew this on the ground himself. There was one last thing to be done. The circle that encapsules the octagon. Once he completes that, his formation would be complete. Cho Ryu Hyang swallowed his spit. Then he slowly drew a circle around the octagon. The stick in his hand followed his hand movements, and drew the circle. The moment before he finished, Cho Ryu Hyang paused. According to the equation, once the circle is completed, the formation is activated. And once activated, even the strongest man in the world would be unable to destroy it. It was that strong. But he couldn’t believe it. He couldn’t believe that an abnormal thing could happen just because of a few lines. Because of the two feelings conflicting with each other, Cho Ryu Hyang was at a confused state. As Cho Ryu Hyang never suffered from a emotional conflict like this, as he was a very logical thinker, this conflict confused him very much. After waiting for a while, Cho Ryu Hyang finally stepped outside the formation. He didn’t feel the need to bet on something that was uncertain to begin with. He stepped out of the circle, and completed the circle. Cho Ryu Hyang looked at the formation with a stiff face. The formation that his teacher gave to him in mathematical form was translated to the ground perfectly. According to the equation, there would be an amazing amount of pressure inside the formation right now. Since Cho Ryu Hyang minimized the formation by 3 times, the pressure would be decreased, but it was still at the level a normal human would barely be able to endure. Cho Ryu Hyang’s posture relaxed a bit. That was because there was no change in the formation even after some time. In his mind, suspicion was growing. Was there really something going on within the formation? According to the equation, once someone goes in, not only will he be bombarded with pressure, but he will also see hallucinations of a great storm. The hallucination will continue to strengthen, until it actually becomes real, and it kills the person inside. Cho Ryu Hyang was full of disbelief now. But the thing was, he didn’t have the courage to go inside. Cho Ryu Hyang circled the formation multiple times, like some dog that had to do its business urgently. The reason he drew the formation was simple. Since he couldn’t solve it in mathematical form, he decided to try the formation itself, and see if he could get any intuition from that. But once he made the formation, he hit another problem. Unless he went inside, he wouldn’t find any solution. After moaning some more like a sick patient, Cho Ryu Hyang shook his head. It seemed that he would really have to enter the formation. But he couldn’t just enter it. He needed something that could ensure his safety. After thinking for a long time, Cho Ryu Hyang went back to his living quarters. A little while later, he brought back something with him. It was a thick rope about 9 meters long. He wrapped it around a tree in the back yard, and tied the other end to himself. This got him a little braver. He didn’t even know if the formation would even activate, but he prepared a rope just in case. If the formation did indeed work, he would pull himself out with the rope. After going through all the preparation, Cho Ryu Hyang breathed deeply a few times. And he put one of his feet inside the formation. Once his foot entered the formation, Cho Ryu Hyang flinched. A little bit later, he had a confused look on his face. He was very anxious, but once he entered, nothing happened. He took one more look at the formation. Cho Ryu Hyang quickly reviewed the equation for the formation in his head, but there was nothing that mentioned such a thing. He was filled with relief and disappointment at the same time. It seems he was actually hoping for a supernatural thing to happen. Cho Ryu Hyang lifted his other foot with a complicated face. He didn’t think it would work. He was really skeptical right now. When he thought about himself putting an hour of hard work into something that didn’t even work, he got discouraged. Even so, he started to prepare himself one more time. A person had to be thorough in everything. If the formation actually worked, the rope he had would be his only lifeline. Again, the formation did not work. The rope wrapped around his waist. He was starting to look awkward, holding the rope with his hands tightly. Cho Ryu Hyang looked around quickly. Thankfully, there was no one around. If someone actually saw him like this, he would die of shame. Cho Ryu Hyang just stood in the formation for a while. Then, he started to erase the lines with his feet. He didn’t want anyone to see even the traces of what happened here. When he thought about his teacher’s serious, noble face, the chances of him joking didn’t seem likely. But the teacher’s equation for the formation clearly said that something amazing would happen if one gets inside the formation. But once he actually tried out the formation, nothing happened. If this was simply a joke, this was too sad. Cho Ryu Hyang kept erasing the lines while thinking about his teacher reproachfully. All of a sudden, he thought of something, and trembled. He stopped erasing the lines. His eyes were shining in delight. When he thought about it, he didn’t put in the 8 variables he found in the formation. No, it’s better to say that he wasn’t able to put it in. Variables were called variables because their values could change at any given moment, after all. How was he supposed to put that into the formation? When he thought that, he started to think more and more. He was pondering upon the subject. Cho Ryu Hyang kept thinking, all the while holding onto the rope in this hands. When he gained a small insight, he once again trembled. If he couldn’t find any answer by calculating all the possibilities he could think of, it was all right to say that there was no answer at all. Cho Ryu Hyang quickly took off the rope tied around his waist, and started running around the backyard. A little later, Cho Ryu Hyang came back with 8 stones, all shaped differently from each other. Cho Ryu Hyang had a big grin on his face. It was as if he found giant lumps of gold. The stones all look different. No, in the first place, stones that look exactly like each other don’t exist in the world. Even if someone tried to make something like it, it wouldn’t work. That was because even though stones were all composed of the same thing, the size, shape, and the weight were all different. And Cho Ryu Hyang had the ability, the “Faultless View of The World”. Using that, he could see the values of each stone at hand. After confirming the values of each stone, Cho Ryu Hyang believed that they would make fantastic variables that would complete the formation without fail. Cho Ryu Hyang picked up his wooden branch, and started drawing again. This time, he drew less carefully, a little rougher than before. The completed formation looked a little roughed up. Cho Ryu Hyang stood inside the formation, and started to put stones at each vertex of the octagon. Did he gain yet another insight? Cho Ryu Hyang’s hands were trembling nonstop as he placed the stones. If there were any parts that were poorly drawn, the energies that flow through the lines should be able to fix it. If it was too badly drawn, the energies would seep out of the lines. When Cho Ryu Hyang gained an insight, countless others followed. Because of the countless insights that were coming at him nonstop, Cho Ryu Hyang forgot about one important fact. When he put the last stone on the final vertex. Cho Ryu Hyang’s entire body disappeared like smoke. Thanks for translating this, and you should take a break whenever you want to. Thank you—-! Lol, Cho Ryu Hyang disappeared—-! Oh no—-!